At 6,288 feet, Mt. Washington is not especially tall by global standards, and in summertime, the peak is scalable by anyone with enough patience and planning. Still, Mt. Washington is the highest peak in the northeastern United States, has nearly the highest recorded windspeed in the world at 231 mph, and casually claims to have the world’s worst weather. In winter, the peak is used as Everest training by some mountaineers. In addition, Mt. Washington can kill the unwary either with cold, avalanche, or ice crevasses. If you fall into a ice crevasse on Mt. Washington, no one’s going to come get you…until spring. The short summer season is a different animal, and the risks on Mt. Washington are significantly reduced. 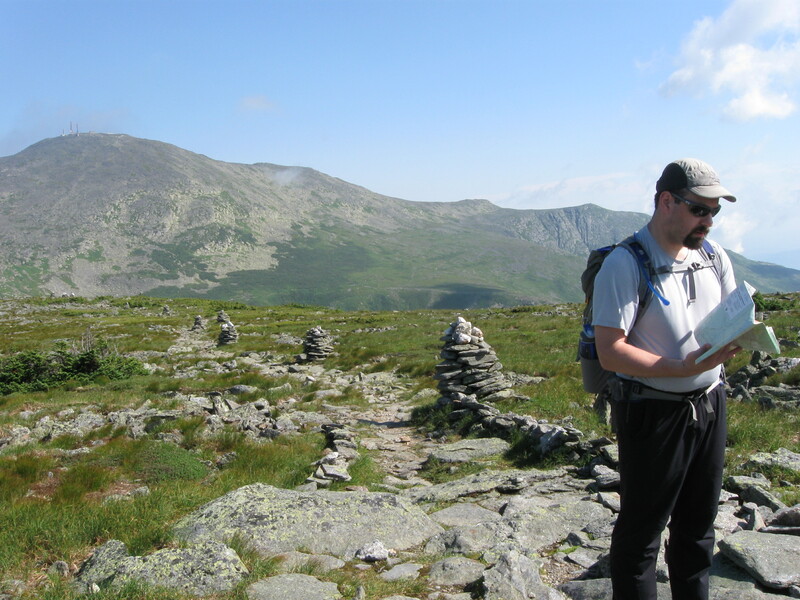 Any multi-mile hike into the White Mountains of New Hampshire at any time of the year demands planning and core, and Mt. Washington as much as any. Approaches to the summit are miles long, generally quite steep, done completely above treeline for significant portions, and subject to changes in weather that can be sudden and dramatic. In that context, here’s an augmented version of some thoughts I shared with a friend who’s planning a hike up fairly soon. Don’t underestimate the amount of water you might want to carry. I sweat rather a lot, and drank about a gallon of water on a ~10 mile hike recently that took roughly 6 hours. Of course, Mt. Washington is rare in that you can get more water at the summit. Water is a really important part of hiking, though – I remember walking over an experienced, fit Appalachian Trail thru-hiker last summer in the Wildcat range who was do dehydrated he was delirious. A rescue team was coming to get him. Having a dry shirt and socks to change into once you summit could be a highlight of your day. If your scalp is exposed, don’t forget a hat. While you can get away without a hat when you’re in the woods, you can’t hide from the sun on a bright day above treeline. Wear a decent pair of shoes. Some folks think they have to have radical hiking boots to go on the trail. I’ve done hundreds of miles in the White Mountains now, and I disagree. You need comfortable, durable shoes; you don’t need boots, especially not when you’re day hiking with a relatively light pack. When hiking Mt. Washington or several other peaks in the New Hampshire Presidential range, consider that the higher-elevation terrain is almost all rocks. Your feet & knees will take a pounding. My feet are wide; having tried several pair over the last 3 years, I am finally happy wearing Moab Ventilators as my 3-season shoe. This is a long hike. You’ve got to pace yourself. So very many people charge up the mountain at first, run themselves out of gas, then have nothing left, dragging themselves to the top. Once you’re at the summit, you’re only halfway done your day! You’ve still got to come back down, and that’s just about as hard as going up. Going down any mountain, especially when it’s steep, is not easy. Unless you’re in good athletic shape already, your body really feels the stress of a long hike. Mt. Washington summit weather could be anything on any given day, is subject to rapid change, and will most likely be different from the weather at the trailhead. Specifically, it will at the very least be colder, and probably windier. So, make sure you get a good forecast for the summit of Mt. Washington before you head up and have a clear idea of what the summit conditions are like. Then pack accordingly. “It’s 85F at the trailhead! I won’t need a fleece!” You might be right, but are you sure about that? Don’t assume. Get the summit forecast..
Mt. Washington is a NH State Park, and there’s a visitor center at the summit with full facilities in summer – food, bathrooms, etc. So, if you get caught in bad weather, the summit buildings offer respite, again, in the summer. (In the winter, these buildings are not open and cannot be counted on for shelter, although the summit is manned year-round.) Still, consider that there’s an awful lot of time you’ll spend above treeline with no shelter from the elements at all. It’s not fun getting caught out in the rain and wind unprepared, which makes for a cold, wet, miserable trek towards the summit. There’s something about being able to see Mt. Washington’s summit bristling with antennas from far away that makes a bad weather hike seem that much longer. On a clear day, the views are worth it. Period. Just pick a trail. It’s hard to go wrong. From experience, I hiked Tuckerman’s Ravine many years ago; the views you get from the east east towards the Wildcats and Carters are pretty impressive. As you gain elevation, you’ll have views north and south to the rest of the presidential range with some well-defined peaks. At the summit, the views are extraordinary on a clear day with sight lines into Vermont, Maine and the lakes region of NH – more square miles visible to your eye than anywhere else I can think of in NH. To illustrate my point about the weather, here’s a couple of pictures from a July 2011 multi-day Presidential range hike I did with my wife. Quite the contrast from one day to the next. Here’s one day, with Mt. Washington still ahead of us (I believe that’s it in the background in the right). It rained most of the day. The summit was so miserable, I don’t even have summit shots from that day. We got in the summit building to change our clothes, warm up, and head down to Lake of the Clouds AMC hut, where we were staying that night. I seem to have “put on a happy face” in this shot. And here’s the next day, with Mt. Washington behind us. It was just beautiful, and quite a bit warmer.